There is, in the circle that I personally move around in, a noticeably increasing number of young people who substitute the participle ‘ba’ preferred by northern Tagalog-speaking provinces in lieu of the ‘ga’ traditionally associated with eastern Batangas and neighbouring communities. Whether the increasing preference for the ‘ba’ is a trend elsewhere in the eastern part of Batangas, I have no way of knowing. It also goes without saying that most if not all of these young people that I refer to are from the school where I used to work, where a growing number of the student population now hails from neighbouring provinces where the ‘ba’ is preferred. In my youth, families that could sent their children away to university in Metro Manila, where the standard of education was generally perceived to be better that that offered by local higher education institutions. This is not at all true anymore these days. The standard of higher education in the province has become competitive with that offered by most Metro Manila universities so that many families no longer see the need to send their children away. 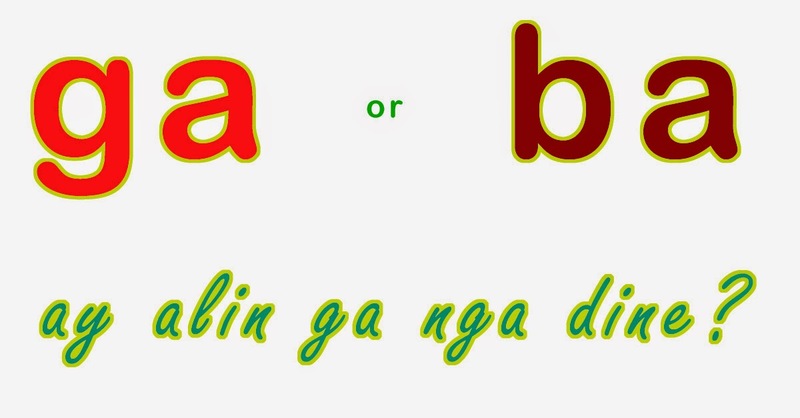 There is, therefore, a certain amount of curiosity to why young people are starting to sell out the ‘ga’ in favour of the ‘ba.’ The substitution, it may be argued, is trivial; yet the ‘ga’ is iconic of the Batangueño culture. The decline of its use will not be a small matter at all. When I went away to university in Metro Manila in the mid-seventies, it was typical for young people from the province to not only want to drop the ‘ga’ in favour of the ‘ba’ but also to learn to speak in the intonation typical of natives of the metropolis. As a rule of thumb, however, the ‘ga’ and the accent snapped back on whenever we were in the exclusive company of fellow Batangueños and most definitely when the rickety old BLTBCo buses delivered us back into our respective hometowns for the weekend. That is why the adoption of the ‘ba’ by some young people of the present day is curious to say the least. Most if not all have not studied even for a semester or two in the metropolis and therefore have not been exposed to the dialect and intonation preferred there. There are, in fact, funnily enough those who have started to use ‘ba’ but continue to speak with the accent typical of the Batangueño. Consider me fussy, but it never quite sounds right done this way. If anything, all they ever succeed in achieving is to sound contrived or phoney. What these young people do not realise is that the ‘ba,’ trite as it may be, is culturally invasive. That it is being adopted is something that can partially be explained by a sociolinguistics principle called prestige. The principle is closely related to the social classes. In other words, young people in Batangas who prefer to adopt the ‘ba’ do so probably without even realising that they associate more prestige to the invasive word, likely because its use is preferred in localities perceived as more advanced or of a higher social standing such as Metro Manila. Time was when Lipa and Metro Manila were separated by a three-hour road trip. These days, one can be in Alabang in as quick as half an hour, traffic permitting. Accessibility brings with it greater contacts in terms of culture but more particularly in terms of language or dialect. That words become main-stream in terms of usage ultimately depends not only on the prestige that people associate with their use but also in the numbers who subsequently use them. I write this piece with the hope that the ‘ga’ will never become archaic. There are many among those who study Philippine languages who consider Tagalog and Batangueño to be the same. This is in recognition of the historical role that the province of Batangas played not only in the development of Tagalog into a modern language but also in its subsequent spread into neighbouring provinces. Hence, to this day language experts continue to look towards Batangas in the search for words that Tagalogs elsewhere have already forgotten to use. While the ‘ga’ is not exactly among these words, it is nonetheless not only endemic to the province but also iconic of the richness of the language as well as the culture. Seen in this light, therefore, young people ought to realise that there is as much if not more prestige not only in the use of the ‘ga’ but also in the ability to speak the rich dialect of the Batangueño, complete with the accent that only those born and raised in the province can muster.